All clocks displayed on the site are absolutely free to be downloaded, viewed and distributed free of cost and without any modifications. These clocks can be run on any computer with a flash player installed. This website does not directly create or sell any other software products. We do not provide support for any products discussed or featured on this site including MatsClock Free Flash Clocks Swf. All information on this site is for information and entertainment purposes only. While we do not intentionally make any false claims, we cannot be held responsible for any fact that may have been unintentionally mis-stated. The MatsClock user is not to change or modify any MatsClock downloaded from this site or from any other source. All the MatsClock models currently available are free to be downloaded, free to be distributed, free to be gifted, free to be displayed on any website and powerpoint presentation slides as is, without any modifications or alterations and anyone clicking on any MatsClock must be directed to www.matsclock.com However if used for commercial purposes or website then the matsclock model displayed should be run from the website owner's server. MatsClock.com is not responsible for any damage caused directly or indirectly by use of matsclock flash movie files and no compensations will be paid. Users are cautioned to use their discreation to view or download matsclocks swf movies and use them at their own risk. wwww.matsclock.com will never ask for Credit Card details and request that you do not enter it on any of the forms on www.matsclock.com. All External Software other than matsclock models discussed at matsclock.com are free trials that may be used to do a free scan of any computer. However, you may need to register at the respective vendor's websites to get the full potential of the software. You are advised to reach the vendor's authentic websites directly from the software. MatsClock.com also may discuss a few external software and may provide links to them. These software are not hosted on matsclock.com but merely discussed for entertainment purposes and links take you either to the original software vendors web pages or the links referenced at matsclock.com may start a download of these external software from the respective software vendors websites or servers. 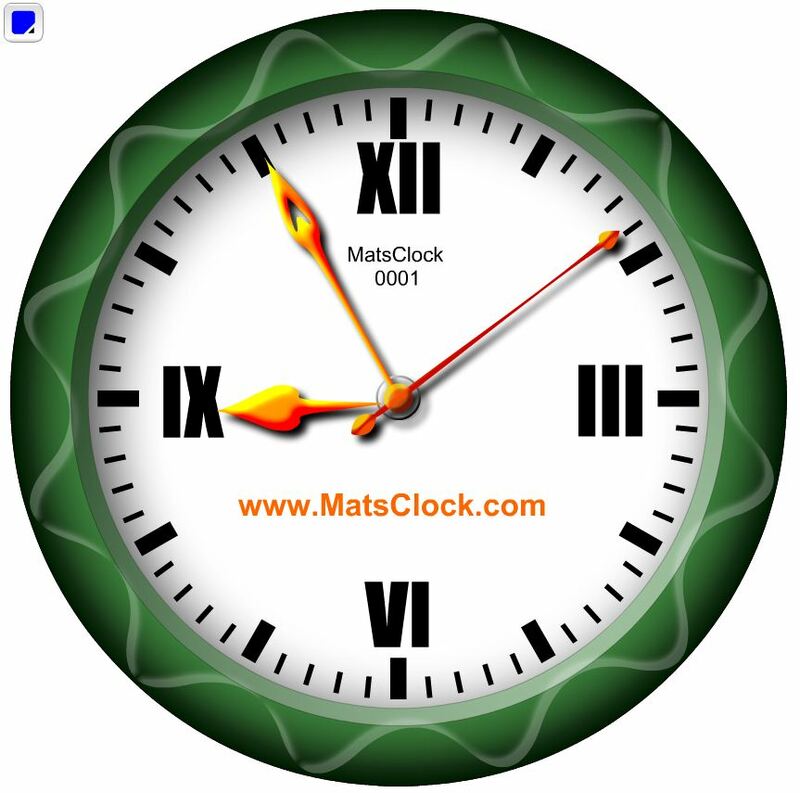 www.matsclock.com and its creators are not liable for any loss or damages caused by the use of software reviewed on this website. Use of reviewed or recommended software is not guaranteed, nor is www.matsclock.com and its creators liable for any consequences good or bad as a result of their use. Remember the risks whenever you use the internet. While we do our best to protect your personal information, we cannot guarantee the security of any information that you transmit to www.matsclock.com and you are solely responsible for maintaining the secrecy of any passwords or other account information. In addition other Internet sites or services that may be accessible through www.matsclock.com, have separate data and privacy practices independent of us, and therefore we disclaim any responsibility or liability for their policies or actions. Please contact those vendors and others directly if you have any questions about their privacy policies.